Get Lucky, go fishing on the Lucky Hat Charters! Lucky Hat lll is a 34′ Silverton 12 Foot Beam inspected by the Michigan D.N.R. and licensed by the U.S. Coast Guard, member M.C.A. and N.A.C.O. The boat is located at Crosswinds Marina Slip 91 and run by Captain Tom Bunce. 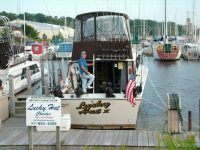 The Lucky Hat III runs 6 hour fishing charters and has the latest equipment: Full Cabin, VHF Radio, All Fishing Equipment, 35 mile radar, Garman Color Graft, Stand-up head (bathroom), dinette & bunk, GPS, Cannon Downriggers. 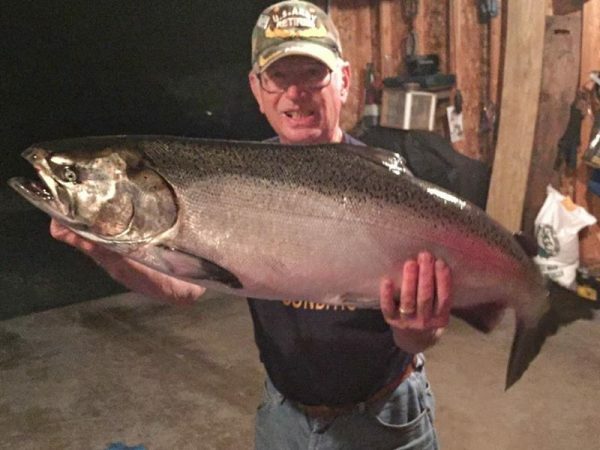 We fish for: Steelhead, Brown Trout, Lake Trout, King & Coho Salmon. Lucky Hat III can take up to six people and cleans all fish! Ask about our Catch and Eat Program. 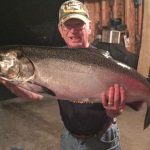 GUARANTEE A FISH ON YOUR LINE OR THE TRIP IS FREE! !